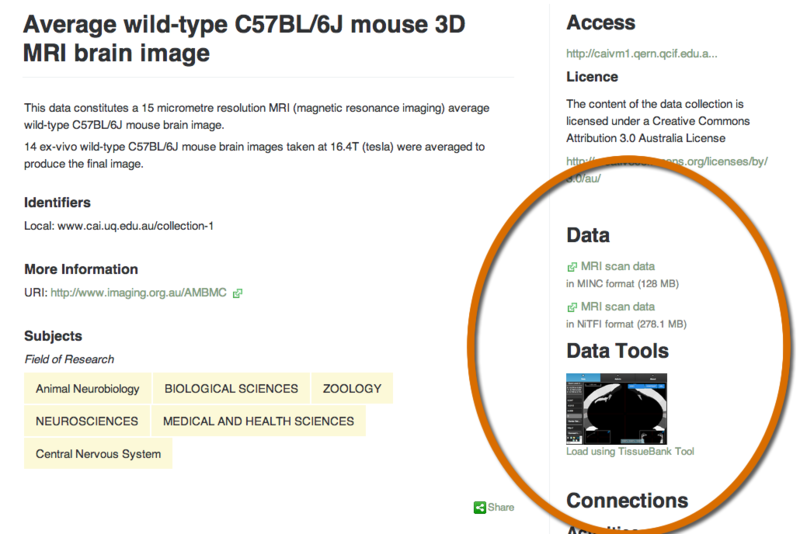 As part of our new ANDS initiative (Connecting Data to Services), the ANDS Development team has proposed functionality to enable advanced users to register metadata about digital assets (effectively item-level collection data) which will be displayed in Research Data Australia under the "Data" heading on the top right of the record view page. Over the next twelve months ANDS is soliciting input into possible ways of connecting data held in one location (e.g. on an RDSI Node) and described in Research Data Australia to services that may be hosted in a third location (e.g. on a Nectar research cloud) so as to let a user do something with that data simply. This something might be as simple as downloading it or it might be a set of online service orchestrations to integrate or visualise the data. Since we think that connecting services to data will make that data more valuable, ANDS is investigating what we can do from within our registry system and Research Data Australia (RDA) to encourage, enable, and facilitate this connection. It is an opportunity for the eResearch community to help us test some different approaches and offer feedback. This is your chance to connect your data to existing services and help shape future ANDS services or enhancements. The investigation focuses on how to help users of Research Data Australia to easily find and apply online services (e.g. NeCTAR eResearch tools or Virtual Laboratory components) to data that is described in RDA and accessible on institutional and national storage infrastructure (e.g. RDSI). A first step is to investigate how best to flag that the data is open and accessible online. The results of the investigation will inform ANDS approaches to interface design, encoding standards, and service interoperability architecture. We encourage interested parties to please contact ANDS staff, or email services@ands.org.au to register your interest. This guide is illustrative only and is currently only supported in the development branch of the ANDS Registry code. No warranty is made as to the support of this functionality in Research Data Australia or in future releases of the ANDS software. Pilot Data Providers can include information item-level data related to collections in part of their feed to ANDS through including a new non-standard element in their feed. This element should be included in the provider's RIF-CS feed, but as this is a non-standard element, the feed will no longer pass validation against the RIF-CS v1.5 schema. The extRif: XML namespace prefix corresponds to: "http://ands.org.au/standards/rif-cs/extendedRegistryObjects". This element is included inside the <registryObject> element (but outside of the collection/service/party/activity elements). extRif:annotations - a container element for extRif fields. Currently supported child elements include extRif:digitalAssets (this guide) and extRif:tags (used internally within ANDS). extRif:digitalAssets - a container element for information about item level digital assets related to this collection. Contains 0 or more extRif:dataAssets elements. extRif:digitalAsset - information relating to a single data asset (such as a file or zip archive) associated with this collection. Must contain at least 1 extrif:url element. visibility attribute - defines whether this digital asset is intended to be displayed on the RDA portal or is only for service consumption. "public" for visibility on RDA; "serviceOnly" to restrict this to web service request only.